2. Meat spoils easily. It must be kept in a cool place or in the refrigerator. 3. Beef that is tender has a fine flavour. 4. 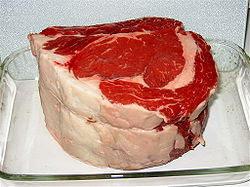 The fat in tender beef is light in color, white or pale cream but not yellow. 5. Fresh pork is tender. The outside cuts are covered with fat. 6. The bone of young animals is light pink, has a fine grain and contains plenty of marrow. 7. The meat has a fine grain and is generally smooth. 8. Tenderloin is an example of a tender cut of meat that is expensive. 9. The less tender cuts of meat have rough tissues. They are cheaper than the tender cuts. There are many recipes wherein you can use meat like pork sinigang, hamonado, mechado, menudo, afritada, paksiw na pata, beef steak, grilled dishes, bofis which uses internal organs, liver steak and many more.